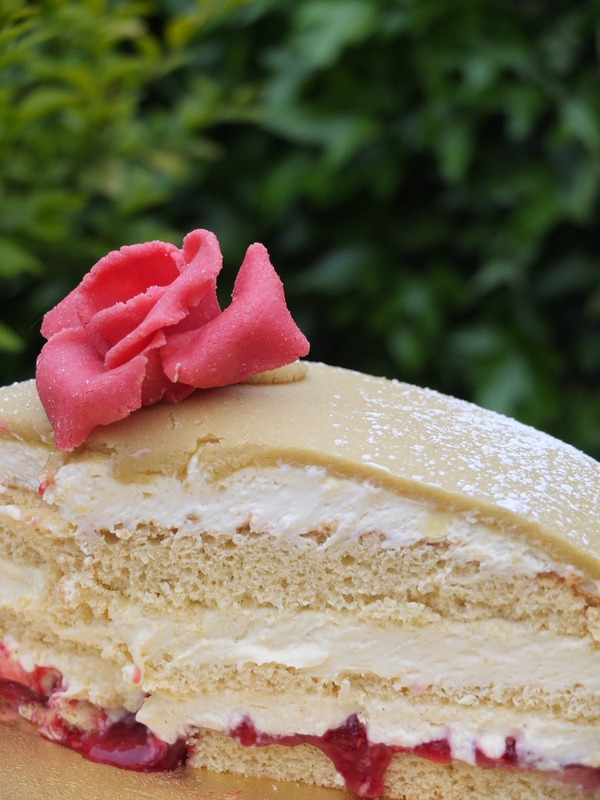 Grand announcement to my family the other week: it’s my birthday and I want a Princess cake! 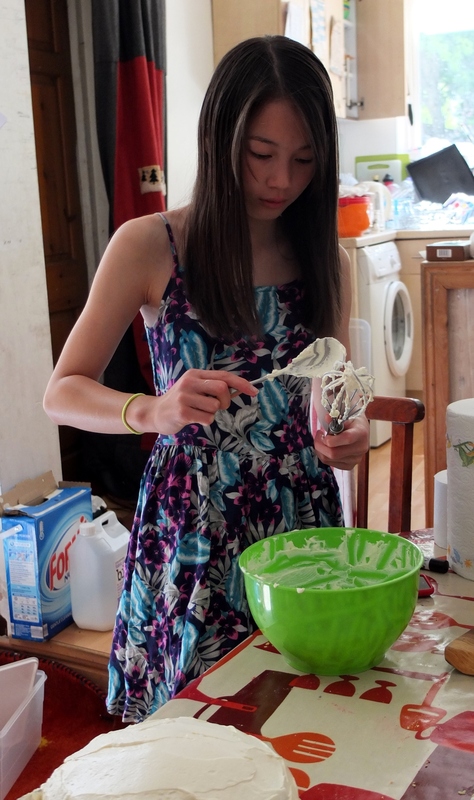 I didn’t have to stamp my feet or throw a tantrum because I was of course making my own cake. My family were peturbed, imagining a pink multi-layered creation. No, no, no, … it’s a pale green multi-layered creation. 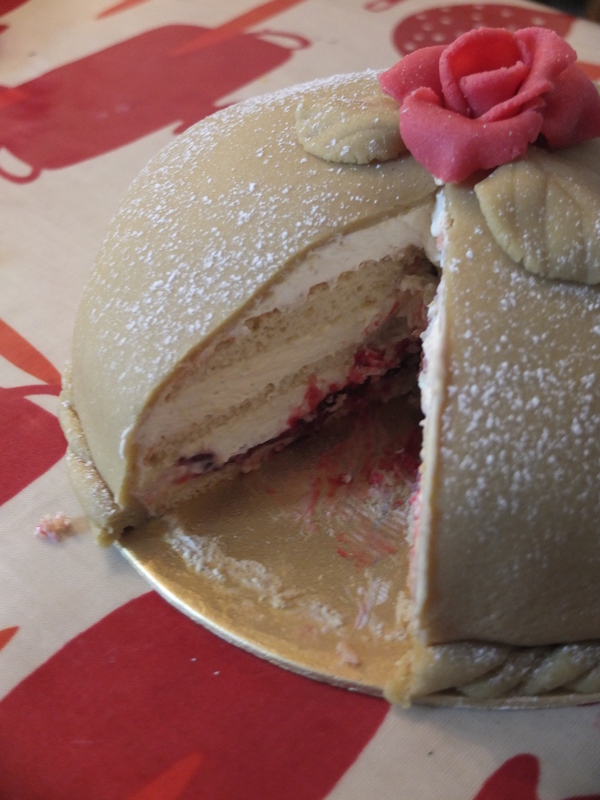 More about its Swedish origins and ‘Princess cake week’ later. If you’re familiar with this cake you’ll know it’s not a superfood, sugarfree or anything-free. Just guilt-free dear reader because it was my birthday! 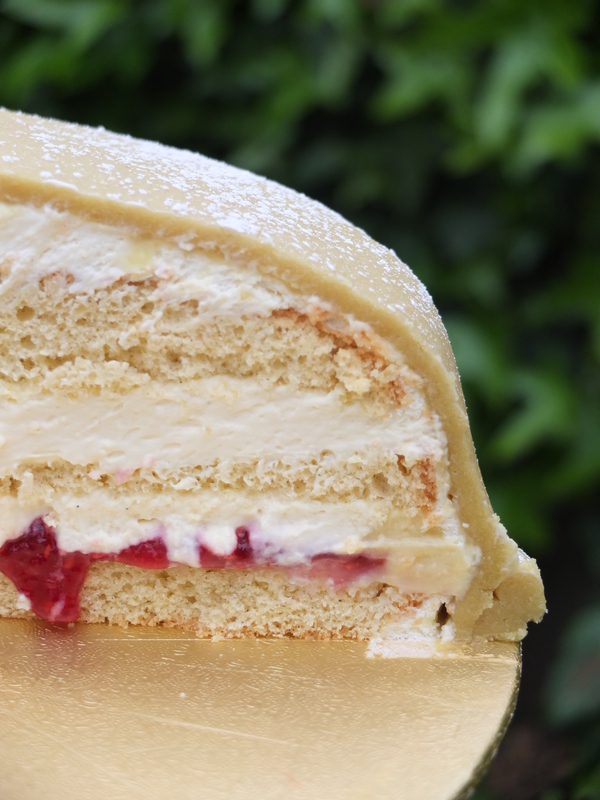 With a Swedish Princess cake made up of three lovely light sponge layers interspersed with crème patissière, whipped cream and homemade raspberry jam, covered in a layer of delicious homemade marzipan magically empowered to turn all marzipan doubters into converts. All made with the wonderful assistance of my 11-year-old niece and mum, and lots of love. I luuuuv my Princess cake! 🙂 I love a lot of cakes but I have a very weak spot for this one! My family all tucked in and enjoyed those soft yummy layers, discovering a new love for marzipan. I can see why this is Sweden’s most famous and popular cake without which no birthday or celebration is complete. 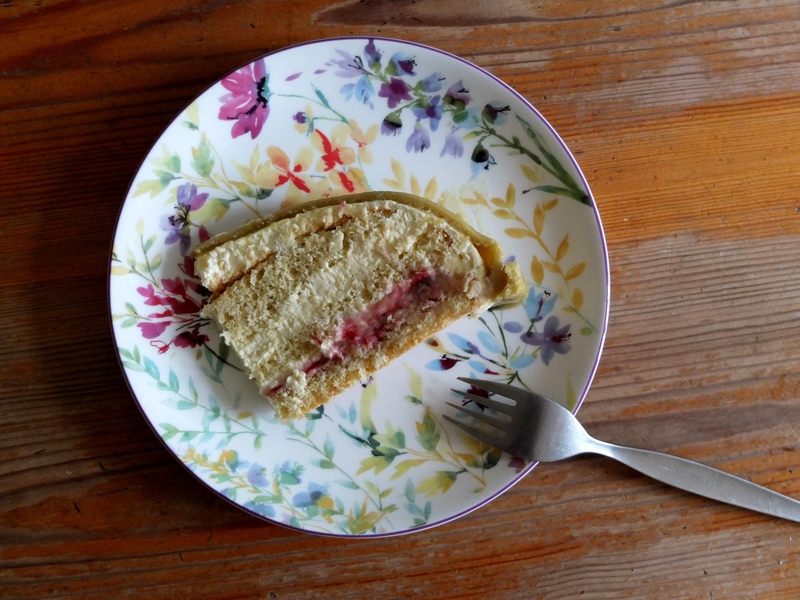 Actually, making this cake wasn’t all fairytale and the happy ending seemed elusive. I didn’t tear at my hair because that’s unhygienic. Just growled a lot. 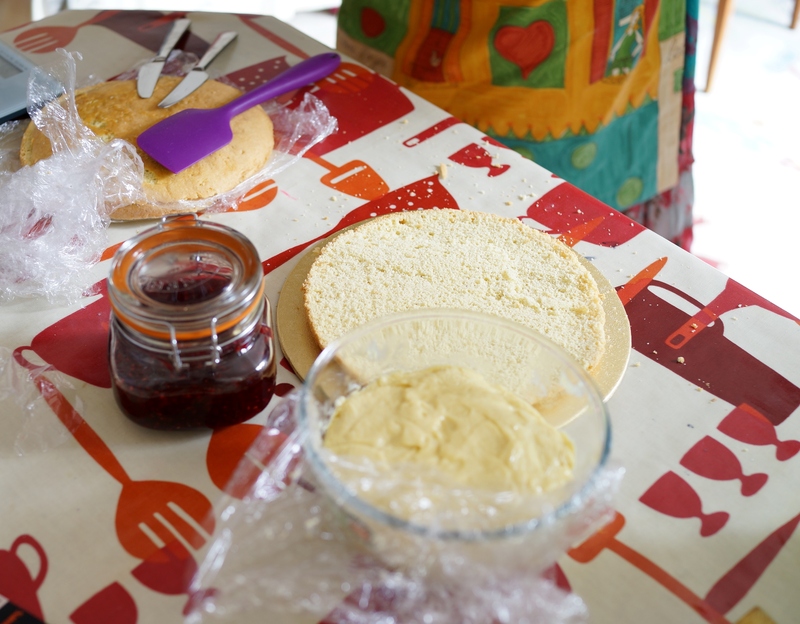 But I learned many things on my first proper jam and marzipan-making adventure, aided by jam advisor Mum and the internet. So let’s check out this now fairly straightforward step-by-step recipe. 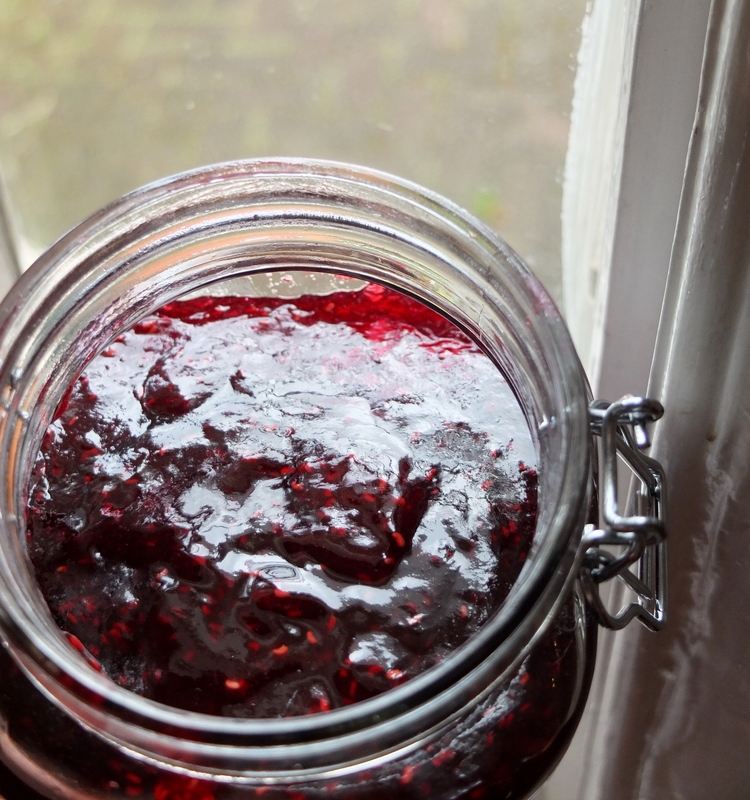 You can play around with quantities and use any red berries, but too little sugar produces runny jam. I once used Xylitol (a sugar substitute), which produced a strange-tasting gooey opaque..um.. thing. Very sad. This one with sugar’s lovely. 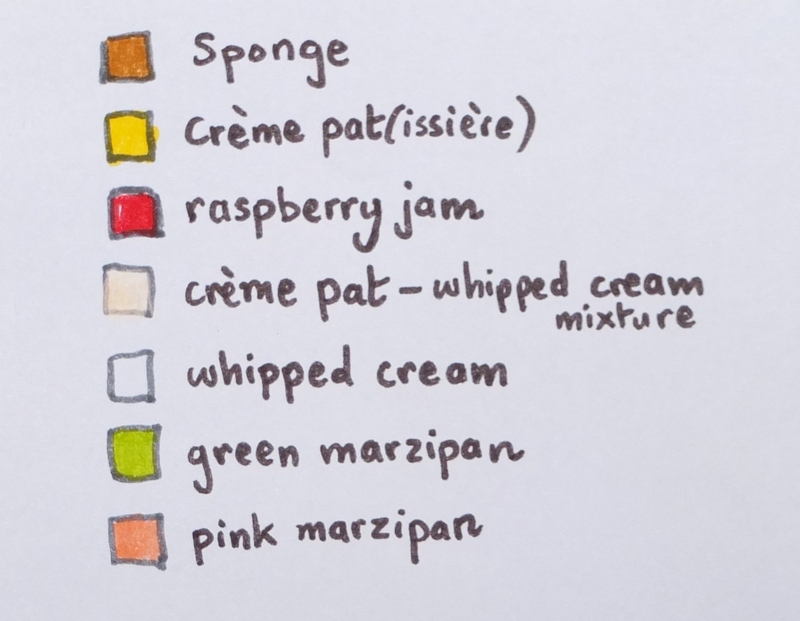 Please see here for my Raspberry jam recipe basics page. 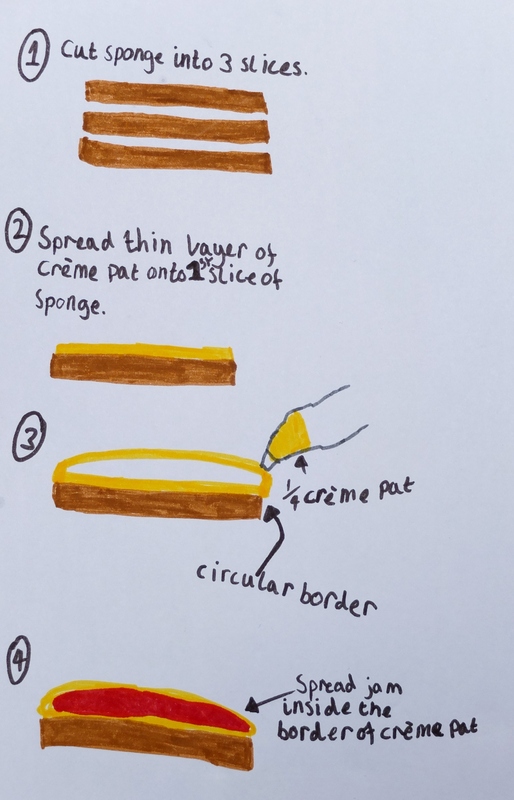 For how to make it see my Crème pâtissière recipe basics page. 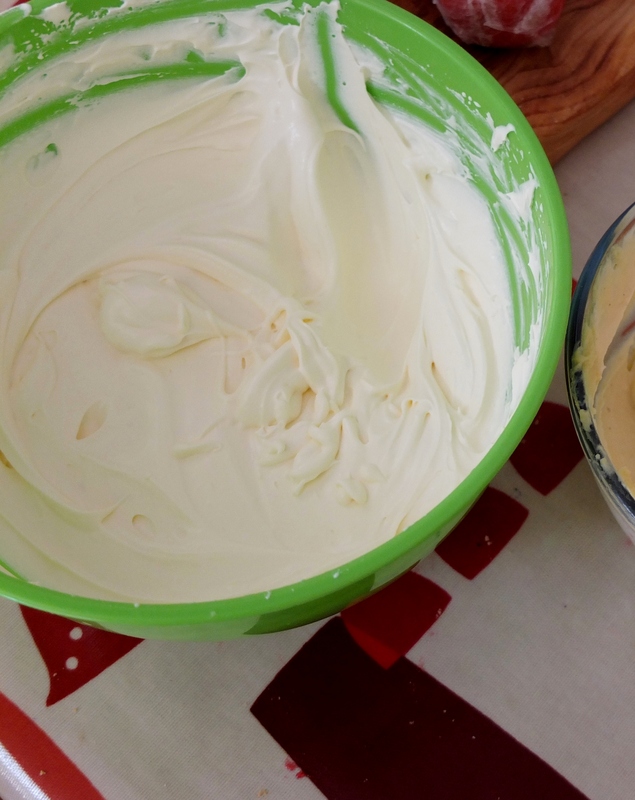 Butter and flour your cake tin and line the bottom with a circle of greaseproof paper. 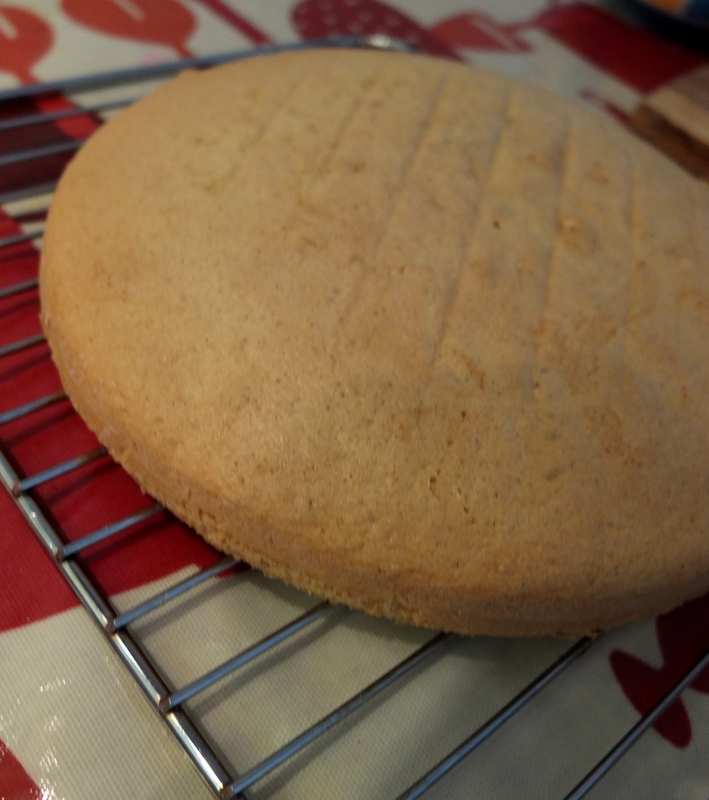 With a 23cm diametre tin the cake is fairly flat, with slimmer layers. Next time I’ll try a 20cm diametre tin as it should be easier to cut even layers! Melt the butter in a saucepan on low heat and allow to cool slightly. Whisk the egg yolks and sugar in a big bowl till pale and fluffy, and making a ‘ribbon’. 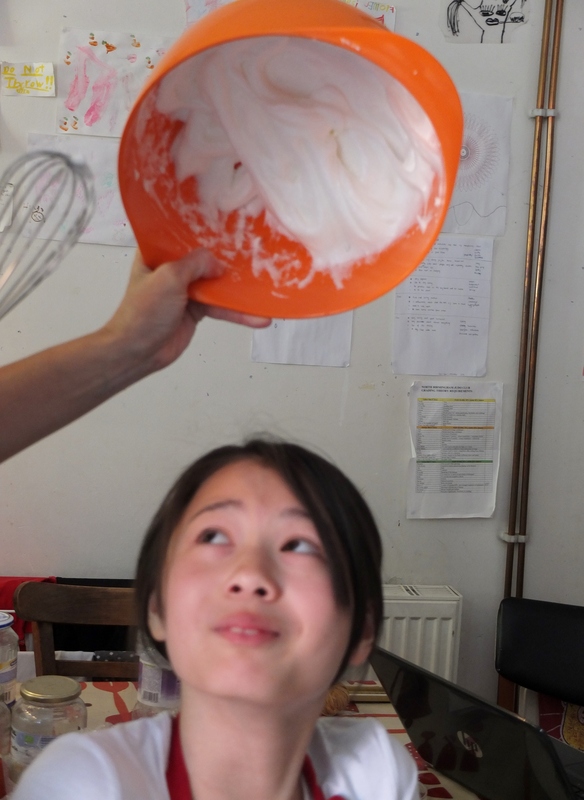 Sift and whisk together the cornflour, flour and baking powder. 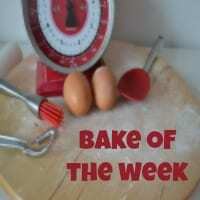 Fold in a third of the flour and a third of the egg whites into your egg and sugar mixture. Fold gently with figure of eight motions. When almost incorporated fold in another third of flour and whites, then the last third. DON’T OVERMIX. But try to be fast as the baking powder is already reacting with the wet stuff and it needs to go in the oven as soon as possible. When almost incorporated, fold in the melted butter. Again DON’T OVERMIX. Fold till just incorporated. Pour carefully into your prepared cake mould and bake in the middle of the oven for 25 to 30 minutes. It’s ready when an inserted skewer comes out clean, the sponge is coming away from the sides and the top springs back a little when pressed lightly with your finger. Marzipan – family members who don’t like shop-bought marzipan loved this wonderful homemade version. 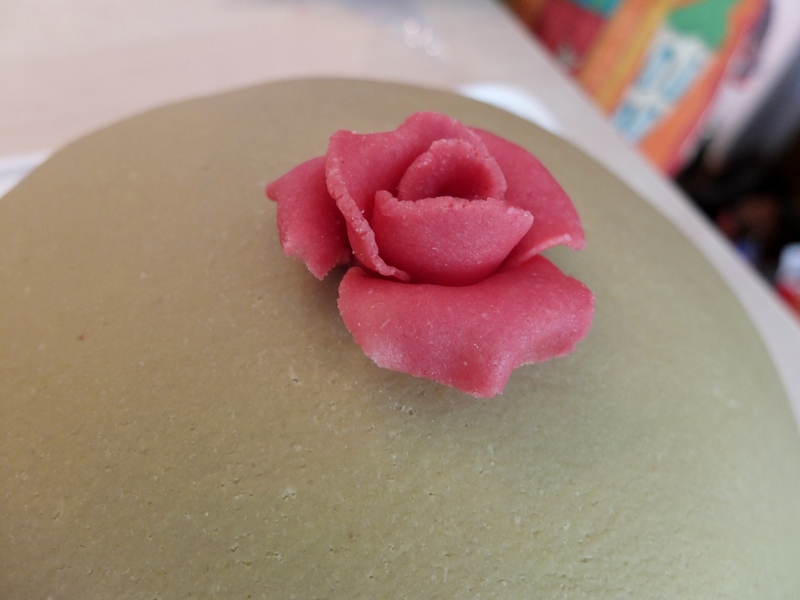 Separate a small ball for the rose and knead in a tiny amount of pink or red colouring gel or powder. Add some little by little as necessary. I’d have added slightly less colour than my niece did here but it’s still a lovely shade. 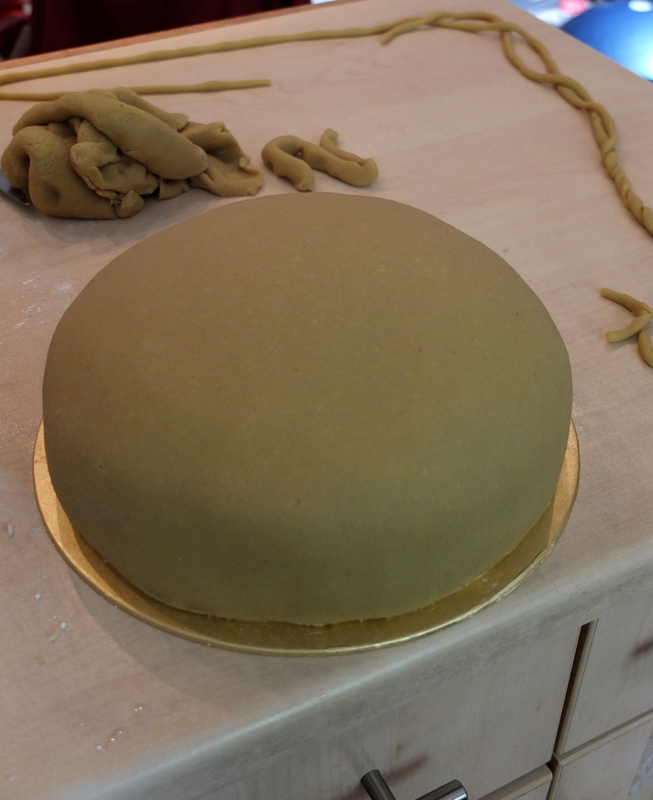 Knead in a tiny amount of green colouring gel into the big ball for covering the cake and the leaves. Depending on the light my cake was quite pale olive or pistachio. Next time I’ll add a little more green. If not using immediately, wrap tightly in plastic film and store in the fridge overnight then massage just before rolling to make it pliable. 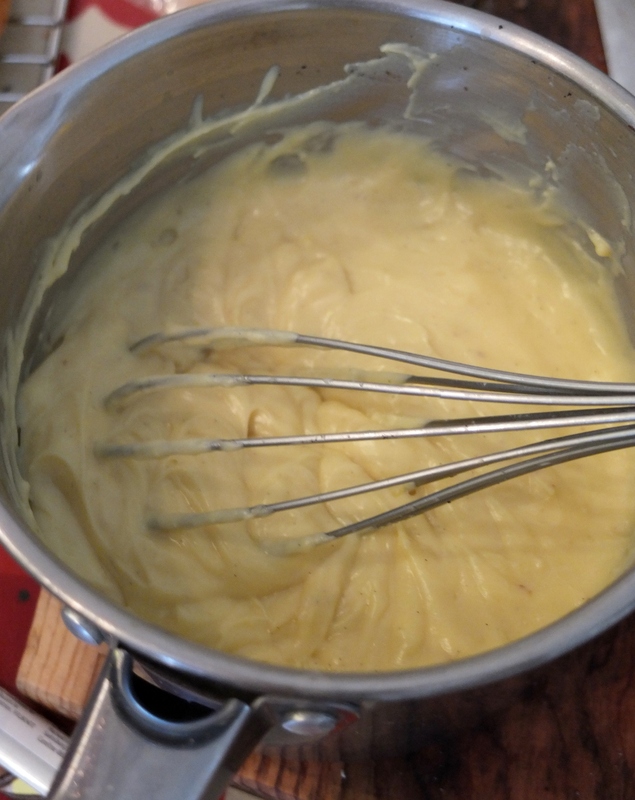 595g (600ml)/2 and two thirds of a cup double/heavy cream – whisk to stiff peak. Here are some photos taken by mum and little drawings by me and my niece to refer to when assembling this cake. After the cake’s been one or two hours in the fridge, make the marzipan (if you haven’t already) and roll out not too thinly. 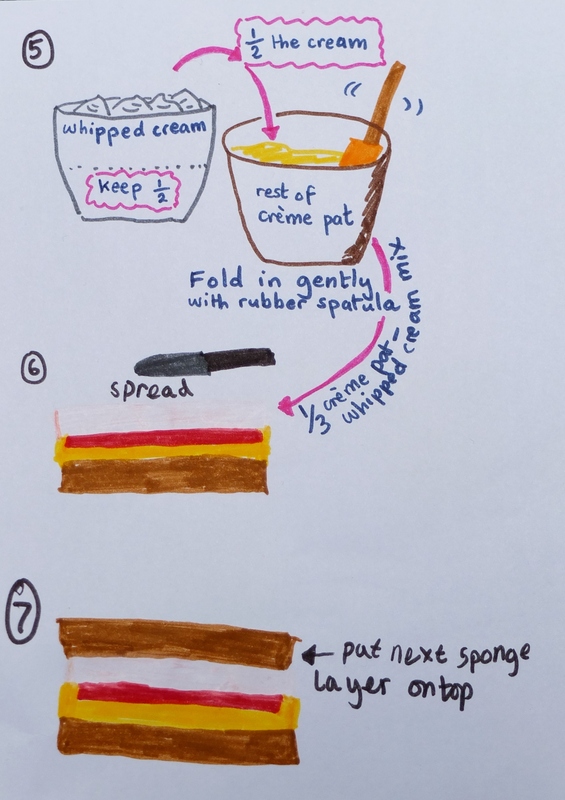 Wrap very carefully around the rolling pin to lift over the cake and carefully unroll to cover the cake. 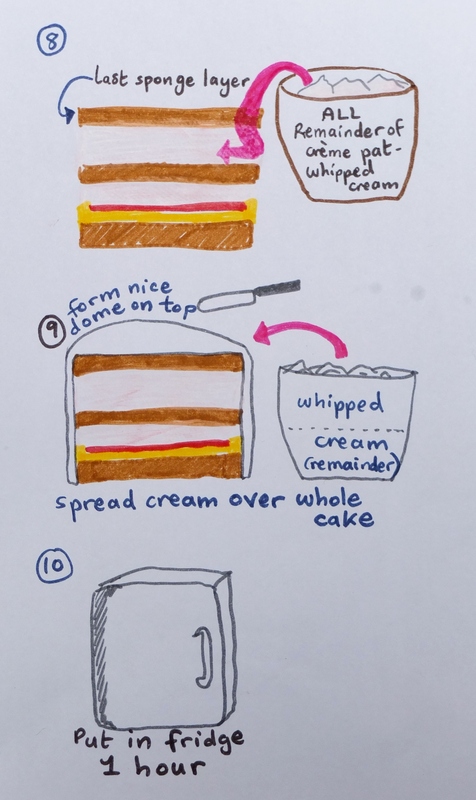 You only get one chance to do this, because after the marzipan touches the whipped cream you can’t roll it again. A suggestion from Oh, I made it is to practise covering a round bowl first. 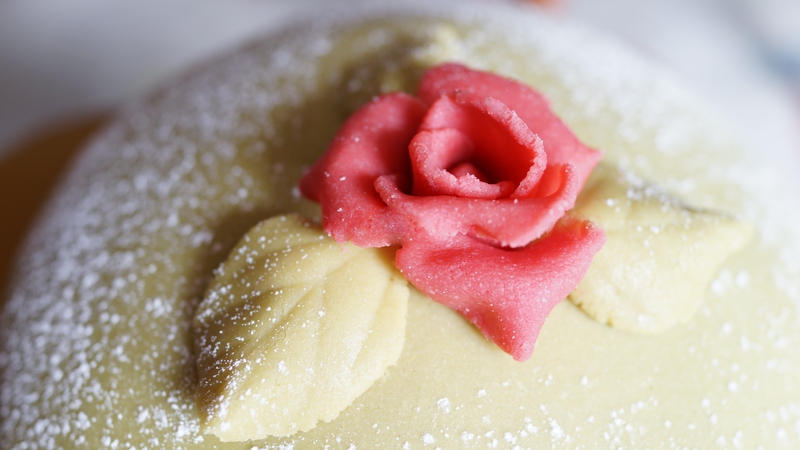 Detailed instructions and photos for making the marzipan braided rope border, rose and leaves are on my Sant Jordi festival cake post. Finally, sprinkle icing sugar on your cake. 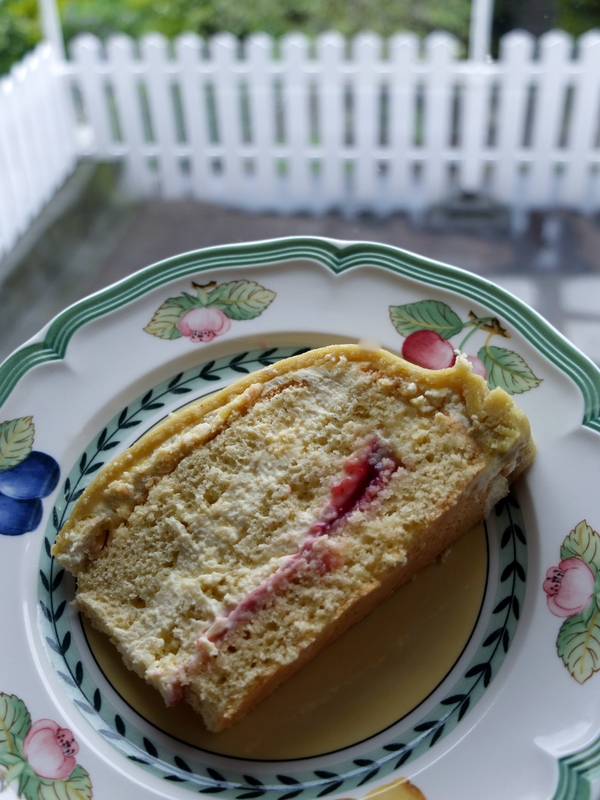 The recipe was first published in 1948 as Green Cake (for obvious reasons) by Royal home economist Jenny Åkerström who taught Sweden’s three princesses, Margaretha, Märtha and Astrid. They loved the cake so much it was later named Prinsesstårta, Princess cake. 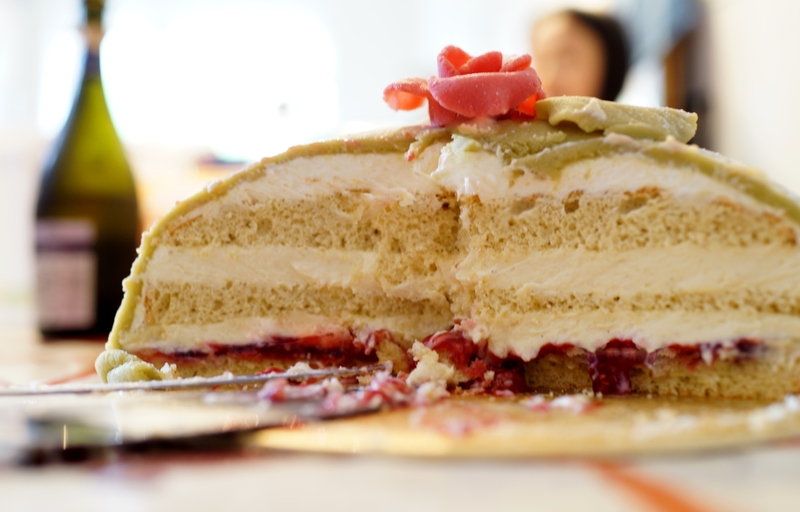 And the Swedes love it so much they have a national Princess cake week! No joke. It’s at the end of September when the cakes are decorated with little crowns and a percentage of the proceeds from sales go to charity. 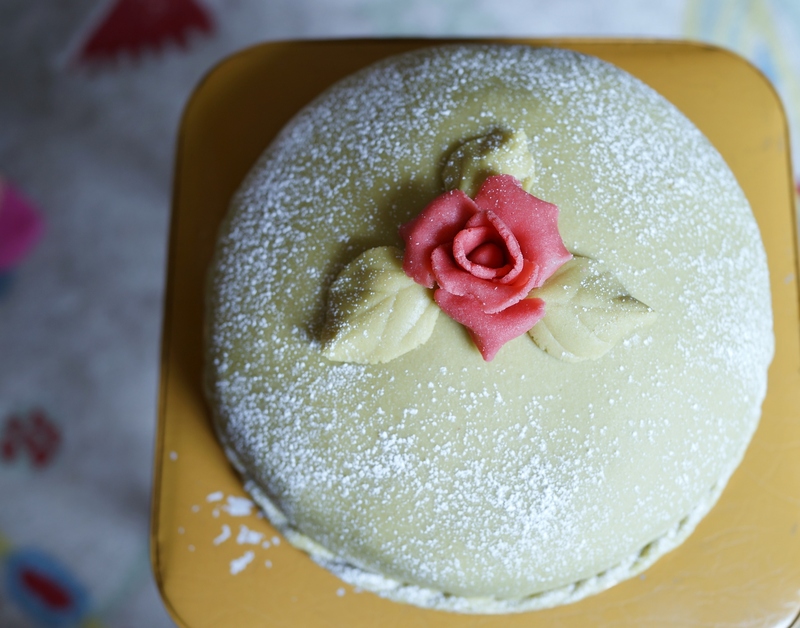 In Sweden you can also find ready-to-make Princess cakes to assemble with cake mixes. I usually avoid cold weather but have a sudden yearning to tour Sweden around September! 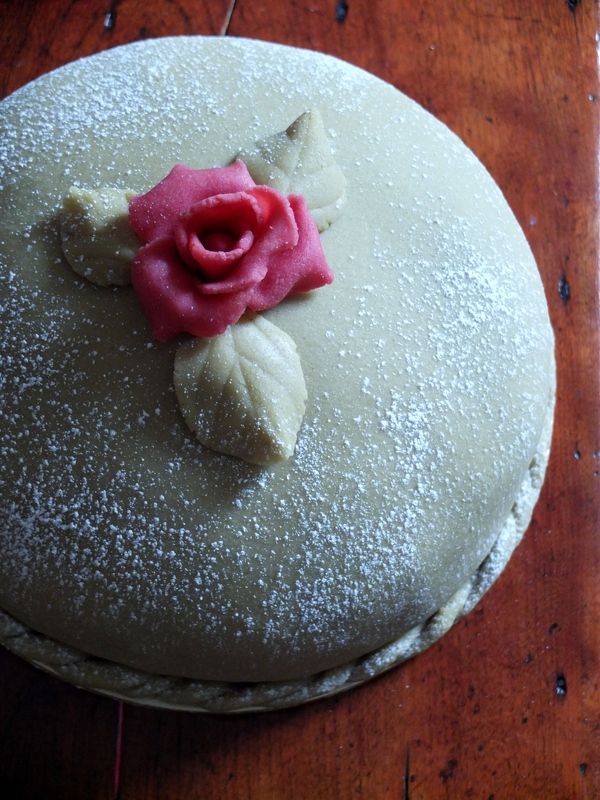 🙂 Meanwhile, perhaps you’d like to read more detailed Princess cake research on Semiswede’s blog? 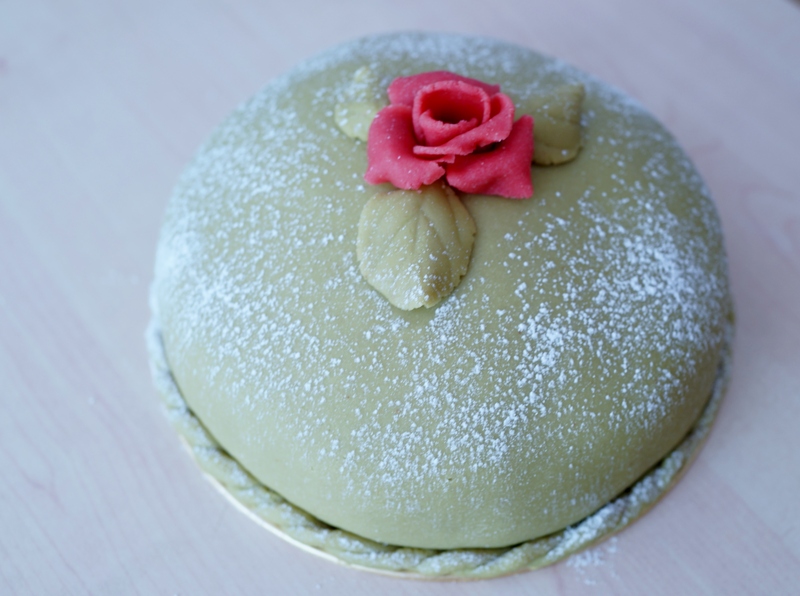 A litle slice of Swedish Princess cake? 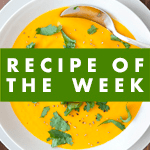 Yes, yes, cake, you can go to Recipe of the week too – but that’s it!!!! !